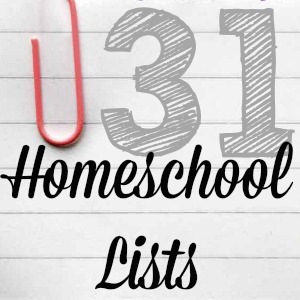 Homeschoolers use their homes hard. What cleaning tasks give us the biggest bang for our time bucks? 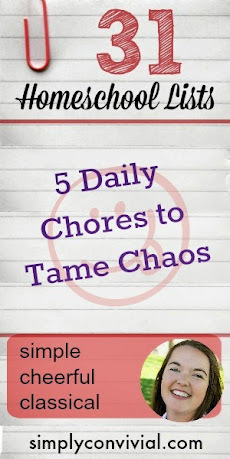 What chores prevent chaos best? That’s what today’s list is all about. 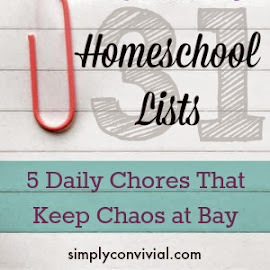 So much happens in a homeschooling house. You are running a hotel, a restaurant, a school, a psychiatric (oops, I mean) counseling ward, religious house, and maybe even neighborhood watering station. It is astonishingly easy for the house to simply disintegrate into a massive heap of ruins within the space of an hour. Here is my list of things we have to do everyday to prevent that state of chaos from settling down permanently. Bonus: Most of these can be delegated to children! 1. Dishwasher unloaded and loaded again. Meals come and come again, so the dishes have to be washed. Get dishwasher loading and unloading into the groove of routine so there’ll be enough bowls at breakfast and enough plates at dinnertime. Tip: 4-year-olds can unload silverware. 2. Kitchen counters need to be cleared. There’s no place that attracts clutter piles like kitchen counters. That stuff has to get dealt with – so that there’ll space for the stuff to accumulate again tomorrow. I like to clear the counters in the evening and then take a moment to just look at them for a quiet minute after all the kids are in bed. It’s a little payoff for the effort and a small moment of peace. Tip: This is easier if the kids put all their stuff away during an afternoon EHAP. 3. At least one bathroom needs to be clean and presentable. As someone who has had unexpected guests who then need to use the bathroom – take it from me – one bathroom that’s presentable is a sanity-saver! It’s worth the effort, even if it’s just a quick wipe-down with a damp cloth. Tip: Mom should use that bathroom. Tip #2: Children should use a different bathroom. 4. Know what’s for dinner, even if it’s a bag of frozen meatballs. Everyone hates that sinking feeling when it’s suddenly 4 or 5 in the afternoon and there’s no dinner plan. A menu plan is worth the time and effort, and a menu plan doesn’t have to take much effort. 5. Wash a load of laundry. I hate the panic moment, the moment of feeling like an utter homemaking failure, when someone has zero clean socks or nothing suitable to wear outside the house. Sunday morning, maybe, there’s a sudden revelation that there are no clean undershirts. I wash one or two loads of laundry most days so that it’s part of the flow of my day, it’s rarely a huge mountain to tackle, and those panic moments are greatly reduced. Laundry is just like dishes: It has to be cleaned to be made dirty again and it’s a real pain when it isn’t ready when it’s needed. So now it’s a daily maintenance thing in my housework plan rather than a huge weekly project. It’s helped my sanity a lot. What household chores help you keep your sanity most in your house?